#1: If you’re into towing, hauling and hitching anything from sports and recreational items to utility gear for work, you definitely want to make sure things aren’t slippin’ and slidin’ around in your bed – especially in winter weather when a coat of ice can make any pick-up truck bed an especially treacherous place to carry valued equipment. The HitchMate Cargo Stabilizer Bar is one of the strongest cargo bars available on the market and it helps to ensure the “safety first” mantra. Extending 59″ to 73″, it can fit a wide variety of full size truck bed widths – and makes for a quick and easy no-hassle gift for anyone who loves dragging their “stuff” up the mountain, or just around town. #2: And when it comes to truck beds, our Bullet Liner spray-on bedliner offers a market-leading premium elastomer coating that will keep your truck looking brand new – regardless of the elements. With our signature UV-safe color guard, Bullet Liner helps your beauty stay protected from all weather extremes – from frigid temperatures this winter season to blistering hot sunshine next summer. If you – or your truck-owning spouse, parent, son or daughter – are into some serious off-roading, Bullet Liner’s High Caliber Protection will also help mitigate damage from flying rocks, mud and debris out on the trail. It’s great to apply to a truck bed, but also ideal for any part of any vehicle you’d like to cover (including bumpers, fenders, wheel wells, and even floor interiors). Contact a Bullet Liner dealer near you to find out about affordable deals for holiday gift-giving or for the New Year. #4: If theft protection is something you’re concerned about, consider Bully’s new Tailgate Anti-Theft lock. Bully markets a patented tailgate lock that prevents theft by securing the release hinge. Its simple design is easy to install and remove – and it’s almost impossible to use any conventional device to cut or break the lock. #5: Finally, for another easy under-the-tree gift idea, Seat Armor seat covers help protect expensive leather or cloth seats from damage, UV rays, pet dander, unwanted scratches, sand/dirt and everyday wear-and-tear. They’re made from 100% heavyweight cotton/terry velour and are offered on Amazon.com. 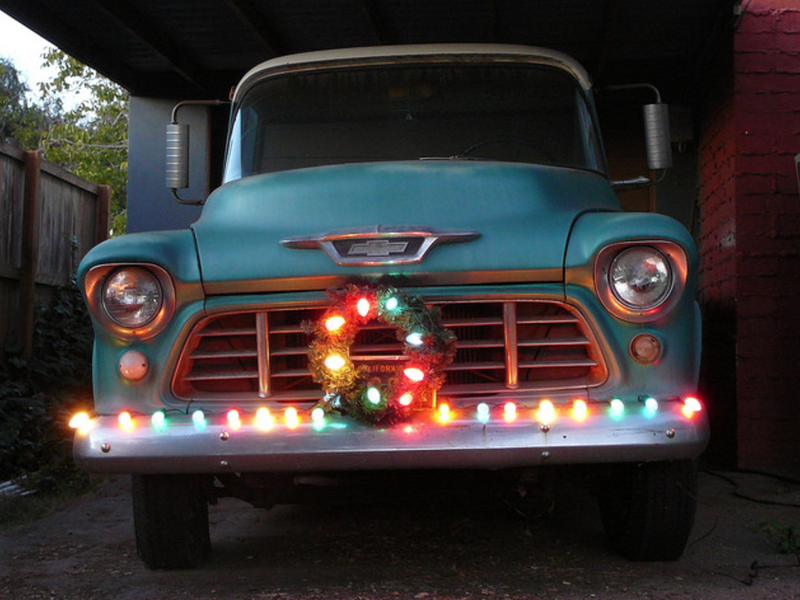 So enjoy the season—and remember to inject a little jingle into your V-8. And from our crew to yours…Happy Holidays.